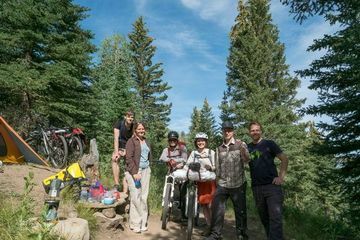 SLC Bicycle Touring & Bikepacking (Salt Lake City, UT) | Meetup) This group is "semi-private" due to some of our members' concerns. If you are interested in learning more about our trips, please do join as a member -- and see below for a preview! Hope you will join us and pedal off to some good adventures! This group was founded in 2012, and continues to host many overnight and weekend trips. Here's a few samples of recent and past adventures. What about Fat Bikes? 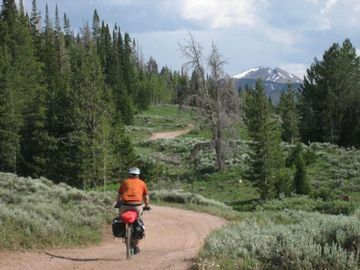 Fat bikes or 29+ are often a bike of choice for bikepacking, especially in sandy areas. There is an active local fatbike group on Facebook that will help you find fat bike day rides, especially in the winter. We do least one overnight trip per month, March through November. Here's a few samples of past trips. Strawberry Narrows, a must-ride singletrack trail along the reservoir, and lovely campsite by the lake. 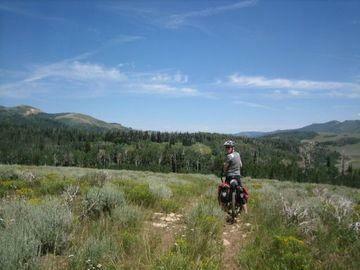 Loop completed on forest service roads and an unused ATV trail. The wildflowers and trails along Skyline Drive near Fairview were spectacular! This 70-mile loop included a variety of terrain. We pedaled along the alpine ridgeline, swooped delightedly into Reeder Canyon, and ascended creekside through Joe's Valley. Two nights, great trip! High Uintas bikepacking trip near Whitney Reservoir, a wonderful way to escape the heat. We camped overnight along a lovely lake. The alpine meadows are a world away from Salt Lake City; this trip may become an annual favorite. 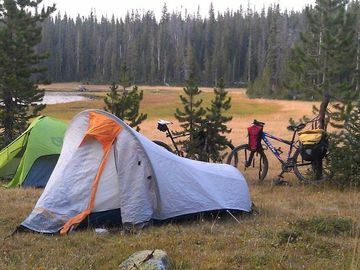 Uintas Exploratory Bikepacking, a new adventure to start the group. This was our very first trip, and we had a great time!